Erin Saur, Planning and Zoning Administrator for the Village, has been leading Rouge Rescue volunteers at Douglas Evans for eight years. Just before 10 a.m. on Saturday, May 19, she greeted each volunteer and presented the sign-in sheet to them. Volunteers ranged from Boy Scouts to a political candidate. 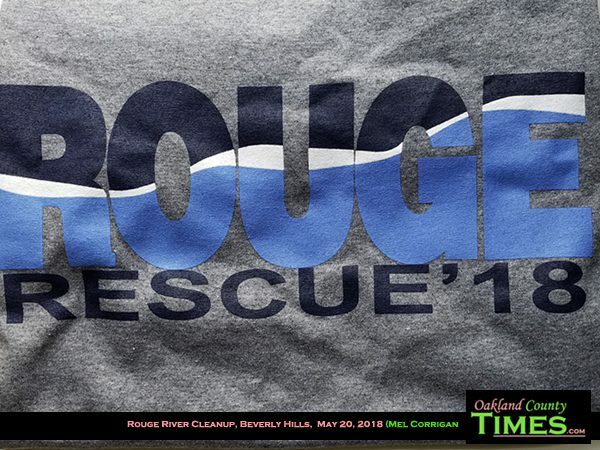 Most of them were local to Beverly Hills and hadn’t participated in a Rouge Rescue previously. Colin Wojtowicz and Lucas DaSilva represented Boy Scout Troop 1024. “I’m here with the Boy Scouts, doing some community service,” Lucas explained. Rosemary Bayer, a Michigan Senate candidate for District 12, joined for the first time as a Rouge Rescue volunteer. Local residents like Christine and Connie were repeat volunteers. While congregated near the sewer overflow and control building, Erin ran through important tips before heading out to clean-up. She reminded us of the prevalence of poison ivy. Our mission was to remove invasive species that morning. She distributed color fliers to help with identification. Cotton gloves were made available to anyone who didn’t bring their own and compost bags were distributed. Erin led the volunteers up the path toward the park’s entrance, and from there we took to the woods in search of unwelcome flora. 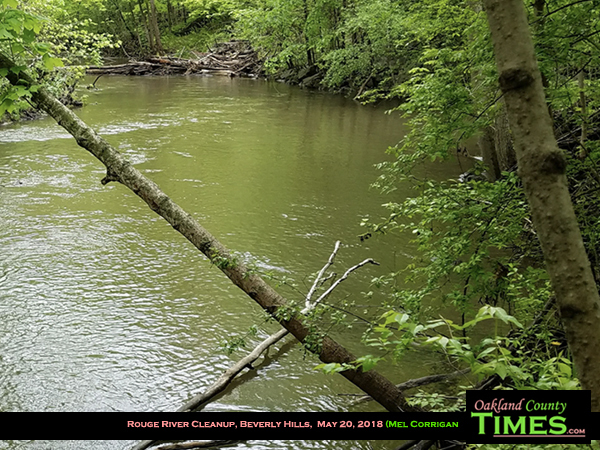 She was right; very few garlic mustard plants were found. Most of the honeysuckle we saw was large and mature. 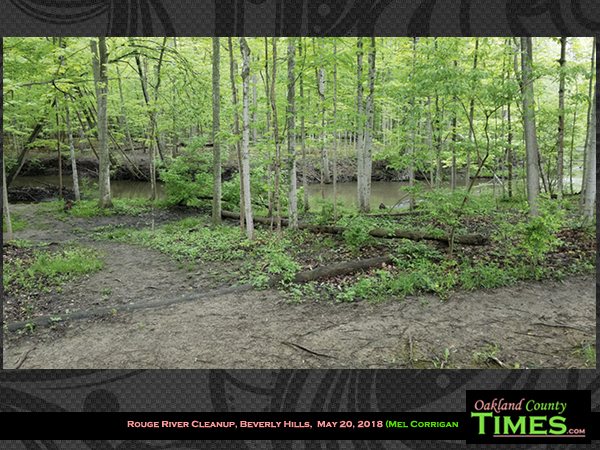 The buckthorn abounded, though, and ranged from new plants to larger, more mature, small trees. Susan Wojtowicz and her husband accompanied their son, Colin, on the morning’s conservation endeavor. Susan said, “A family that volunteers together learns from the experience. I’m happy to participate.” And a great group or family activity it was. 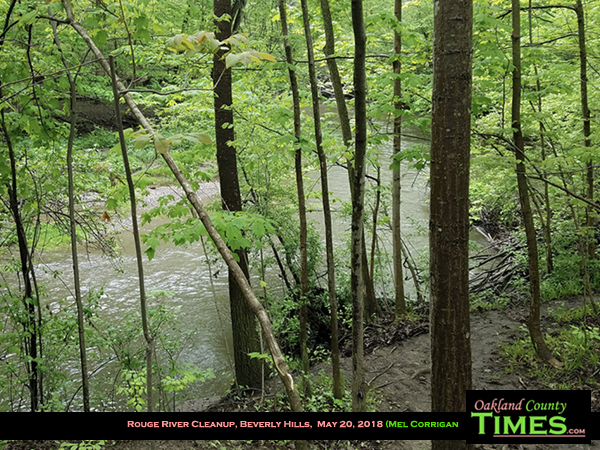 I benefited from the seasoned volunteers, and with their tutelage, spent a good ninety minutes carefully extracting buckthorn from the soft, fertile soil near the banks of the Rouge. 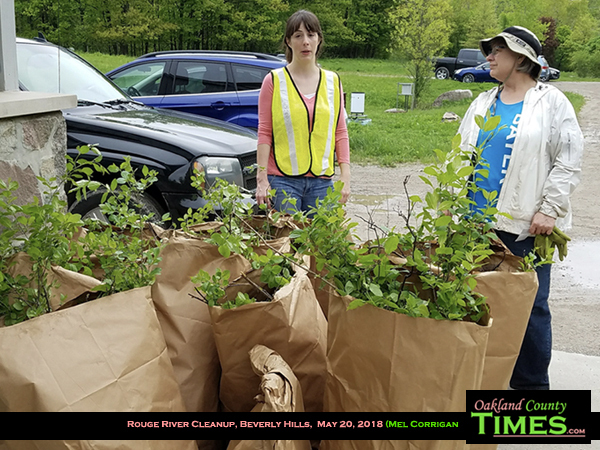 By noon, fourteen volunteers had filled eighteen bags with buckthorn, a bit of garlic mustard and a few pieces of trash. Trash is not a large problem at Douglas Evans, “People are pretty respectful of the space and don’t leave a lot of trash or garbage behind,” Erin explained. 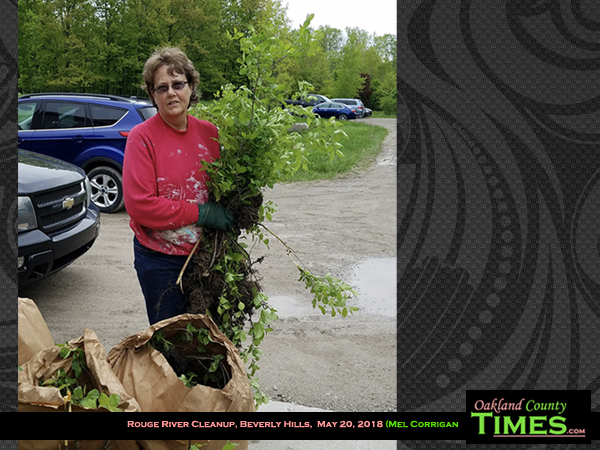 If the gratification of preserving the river or the peaceful, beautiful aura of the park weren’t enough, volunteers were also given T-shirts as a token of thanks. Follow Friends of the Rouge on Facebook to stay abreast of volunteer opportunities. Visit https://therouge.org/ to learn more about preservation efforts (which extend beyond springtime clean-ups) and how to get involved.